Lean Change Management is a collection of innovative practices for managing organizational change. It combines ideas from Lean Startup, Agile, Neuroscience and traditional change management to create a feedback-driven approach to change that can be adapted to any organization. 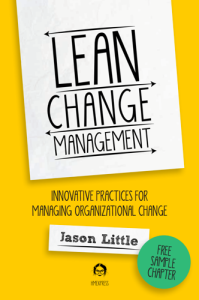 Lean Change is authored by Jason Little with contributions from Andrew Annett and a few other coach friends! If you ask 10 people what “Agile” is, you’re likely to get 10 different answers. Is Agile a mindset? Is Agile a set of practices and processes? Something in-between? What matters is what your definition of Agile is and what approach is most likely to work in your organization. At the end of the day brining Agile into your organization is a change. A big change. In this Live Lesson, available through Inform IT and Safari Books Online this fall, I will help you understand the differences between Agile Adoption and Agile Transformation, and more importantly, help you ignore the dogma that says “you must change your culture to succeed with Agile“. Agile isn’t the point. Organizational change is. The methods I’ll show you throughout this Live Lesson are about how to understand your organization, how to get educated about organizational change, how to determine your execution strategy and how to measure your progress.